The services of the medical profession both enhance and save lives on a daily basis. However, occasionally, professionals can make an error in the treatment of the patient. Mistakes in the health profession can have disastrous health consequences for patients, both physically and psychologically. Regardless of whether the mistake results from human error, procedural failure or mechanical fault, if it appears to have been unnecessary or preventable, the patient harmed as a result may be able to pursue a compensation claim. These types of claims are usually referred to as Clinical Negligence or Medical Negligence claims, with the two terms being used interchangeably. Depending on the severity of the injuries involved and the impact they are having on the injured party’s life, the amount of compensation available can be very substantial. These types of claims are often complex and strongly contested by the NHS Trust or private practice involved. Therefore, it is essential to have specialist legal advice from the outset. For an initial free consultation about making a clinical negligence claim, please contact one of our specialist clinical negligence solicitors. 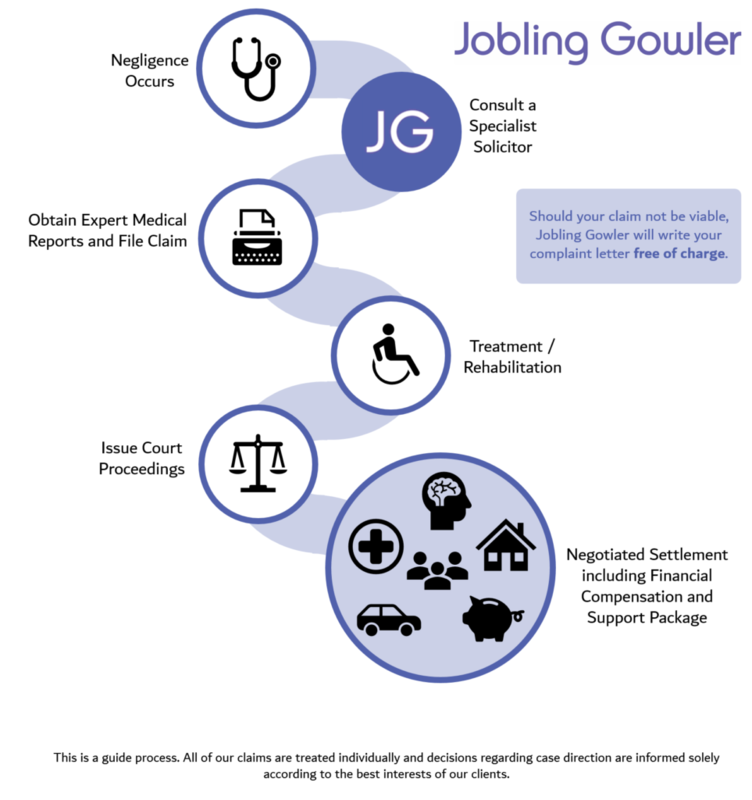 Why Choose Jobling Gowler for your Medical Negligence Claim? Over the years we have developed considerable expertise and accordingly we are recommended in the Legal 500 for the quality of the advice provided. If a medical professional has let you down, it can be difficult to trust another professional. At Jobling Gowler, we offer a service which is not simply about pursuing compensation, but also making sure you have all the practical help and support you need for your recovery. In essence, our goal is to help you get on with your life. We will help you to access a whole range of support packages, based on your individual needs. Additionally, where appropriate, we will pursue early part-payment of compensation to ensure that you can receive the needed services as early as possible. All of this is undertaken with the aim of achieving the best possible outcome for your individual circumstances. What Types of Clinical Negligence Claims do we Handle? What Does the Claims Process Look Like? There is usually a time limit of three years to begin legal action (although there are exceptions). This time limit may be dated from when the negligence occurred or when you became aware of it (known as the ‘date of knowledge’) depending on the circumstances. There are various options for funding a medical negligence claim. Many people choose to be represented on the basis of a conditional fee agreement, sometimes referred to as ‘no win, no fee’ agreement. Public Funding/Legal Aid may be available to those who are financially eligible for certain types of birth injuries. If you need immediate access to funds to cover the cost of essential treatment, rehabilitation services, specialist equipment or other types of support, partial provision for treatment/rehabilitation can be sought in the interim period while your claim is being resolved. These interim payments are intended to make sure that claimants do not miss out on the support they need to make the best possible recovery. Securing interim payments is usually possible where the defendant admits liability but the final value of the compensation has not yet been agreed. Our clinical negligence solicitors will aim to provide a realistic valuation for your claim at the earliest possible opportunity so you have a clear idea of how much compensation you may be able to achieve before deciding how to proceed. If you have suffered as a result of clinical negligence, then please contact our specialist solicitors today. We will arrange a FREE no obligation appointment, either at our offices, at your home or in hospital. During this meeting we will advise you on what are the best next steps for you. We also offer all our clients a FREE complaint writing service which ensures that your matter is dealt with in an expert and professional manner from the outset. Please call a member of our team on 01625 614250 or complete our enquiries form.